If you run a dental clinic, you may have certain ideas in your mind to make it healthier and more stress free. One must be careful of dental design much before opening the clinic. Location is an important factor that needs to be considered. To improve the productivity of the space, you need to consider the interior design, the layout. In the current times, dental offices have attained a new level of functionality, beauty and superior aesthetics. If you are looking to stay competitive in the industry, you need to consider the design of your office. A good-looking office or clinic will attract more number of people. It is also going to change the attitude of staffs and dentists. You may be thinking of changing the design and layout of your dental office, or at least, looking to upgrade the interior. Various important components and factors need to be considered when designing the interior of the dental clinic. The first and foremost factor you need to consider when designing or upgrading dental office is choosing the floor layout. Various kinds of activities are normally accomplished in an office and this applies to a dental unit as well. When choosing a floor type, you need to consider the functionality and comfort level of the dental design chosen. Furniture must be arranged in a way that employees are able to use them. The layout of the floor should be such that maximum space is utilized and components are accessed easily. For a smooth flow of operation, go for a smart floor layout. Whether it is a dental unit or any office, attempts must be made to reduce the level of noise inside. Implement features like sound insulating walls and sound proof glass windows. Sounds from outside traffic, sound of boots or heels can distract anyone. Attempts need to be made in order to reduce noise as much as possible. Lighting system must be chosen carefully as it is important for any workplace. Light should be sufficient enough not to strain the eyes and need not be too bright either. When you are designing the clinic, choose a combination of artificial and natural light source. Natural light can help save on the electricity bill and is an eco-friendly option as well. 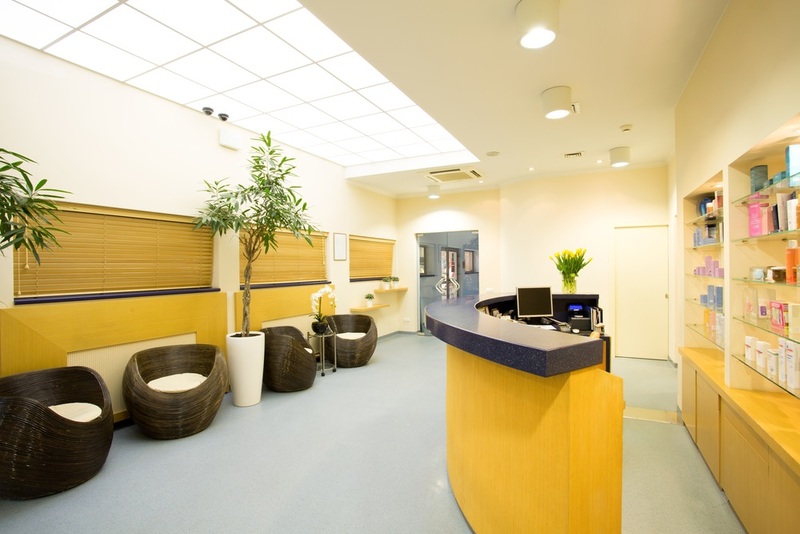 Your dental clinic should have welcoming look to create a great impression on every patient. When the patients enter the clinic, they do not know the capability of the dentists and it is only by the interior that they can judge the quality of services they may expect. The wall color should be light so that the patients are not tensed. Consider using art work inside the unit to calm the nerves. The waiting room is very important from the point of dental clinic. It is the space where the family members of the patients and the patients wait. There must be proper sitting arrangement in the waiting room and the tables must have magazines and newspapers made available for the patients. Place a fish tank or aquarium in the waiting room to brighten up the mood. If you want the rooms to acquire a natural look, you may consider adding a few plants here and there. Plants can add life, color and refresh the air. You may place colorful plants, decorative vases to enhance the appeal. So, when you design your dental clinic, follow the above section closely. You will set up good business by following the dental design tricks.